We leave for Florida in one week. The entire family has seen doctors and specialists for check-ups, immunizations, and advice. We haven’t arranged for private medical insurance yet. We have been very busy. I will save that topic for another blog entry. Because we are going to be travelling on a boat for an extended period of time, our doctors in Ottawa took special care to explain how to respond to some emergencies. Given that we have some pre-existing medical conditions, our doctors made recommendations specific to our situation. Food allergies, for example, affects our family, and prompted our allergist to discuss how to respond to anaphylaxis. Our allergist’s explanation went well beyond the initial, first-response medical procedures that assume an ambulance is quickly available. Initially, I will admit, most doctors reacted with some concern, and one with visible shock. But, once the surprise of our news wore off, and they could see that we were thinking this through, our trip seemed to provide an interesting challenge. One of our doctors’ appointments lasted two hours, when it should have been closer to one hour. And, even after that appointment was over, the doctor sought us out – finding us in the shop below his office as we sheepishly bought candy – to provide us with additional information. Our family doctor was very supportive. She has travelled with her family of six as well. Along with prescribing medication to us for a full year, she recommended that we have our kids eyes examined before we leave. Specifically, she wanted an optometrist to look for convergence insufficiency (CI). As it turned out, one of our children does have CI. And, this condition can cause double vision and difficulties with reading. Fortunately, if diagnosed in childhood the condition can be corrected with regular eye exercises. In planning our medications, doctors considered the sort of medications that might be readily available in other countries. One antacid, for example, is easy to acquire in Canada in tablet form, but may be more difficult to get elsewhere. So, the doctor prescribed the capsule form instead. I should point out that the Canadian medical system doesn’t cover the cost of prescription medications. Everyone pays out-of-pocket for medicine unless they are hospitalized, or have some form of provincial or private medical insurance. In our case, that means a very hefty personal bill to cover the cost of medicine for a full year. Pharmacies we contacted suggested we give them a week of lead time to prepare our medication. But, it turned out that the independent pharmacy we chose could provide medicine to us within a single day. 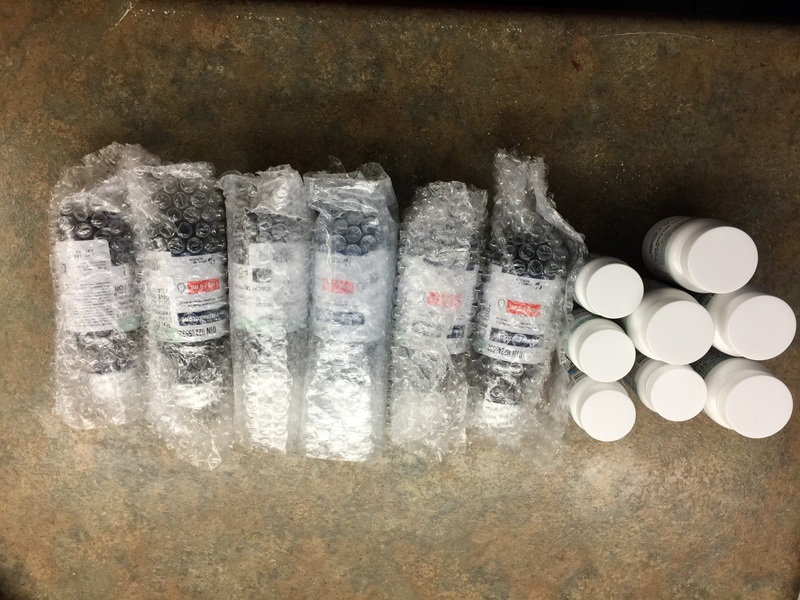 The pharmacy we chose was very careful to pack bottles in bubble wrap, and, to provide capsules in small quantities. The pharmacist was concerned that the capsules might degrade with the humidity on the boat. So instead of giving us 400 pills in one bottle she put 30 pills in multiple sealed bottles. Bottles in bubble wrap and sealed pill bottles, thoughtfully prepared by pharmacist, Joan Hayes, at Medical Pharmacy on Broadview Avenue in Ottawa. Our health is important to us. What we will do when the medication runs out is anyone’s guess. We’ve heard that medication is available over-the-counter in many countries. We’ve also heard that it can be substantially cheaper. Take this as you will – I have the squeaky-clean persona of someone who has never so much as been approached to buy cannabis (pot) on a street corner. Yet, I can imagine myself asking around for antacid capsules. Let’s hope that – when I do find them – this medication and others are not manufactured in someone’s kitchen. Out of curiosity, I called a couple of pharmacies in Antigua yesterday to see if they could fill a Canadian prescription. Filling an out-of-country prescription was not a problem. However, they were limited in terms of brands and doses. When pressed, the pharmacist said they could fill a medication – by sourcing it elsewhere on the island – but, would need some time. Hearing this information, I imagined the scenario would look like someone making some phone calls and then driving over to another pharmacy. “So, about a week?”, I asked. I appreciate the support of our doctors very much. And, I have a year to figure out how to acquire more medication. It sounds like the solution will come when I’m more in tune with Caribbean culture and adopt a more laid-back sense of time. Hi Lorraine! You are good to get all your meds in order just before leaving, this will ensure that they won’t expire too quickly. My son has a peanut allergy and it seems like his Epipen or his Benadryl always needs to be replaced, even though we’ve never used them. I’m very envious of you taking on this trip with your kids and wish I had done it with mine when they were younger. Now that they are 12 and 14, they are very set in their routines and wouldn’t want to rock their world too much, being teenagers and all the stress and pressures that go with that. I hope to be able to follow your blog and keep up on your adventures! Do you have a Facebook page or will I be able to follow through e-mails only? Best of luck with everything and please know that you are in my thoughts. I followed the Stuemer family through every blog that was written in the Citizen, was at Petry Island when they arrived home and got Diane’s signature at their book launch! Take care! Kat. Kat – thank you for your nice note. I enjoyed Diane Stuemer’s book very much, and was fortunate to have spent and afternoon with Herbert Stuemer a couple of months ago. I am on Facebook though somewhat Facebook illiterate. I never login so I always forget my password. Thanks for following our travels. If all goes according to plan we will be back in the water on Monday afternoon.